1. Well, this should be fun and exciting. 707 East Seneca, a vacated parcel that was put up for sale by the city, already has a potential development proposed. 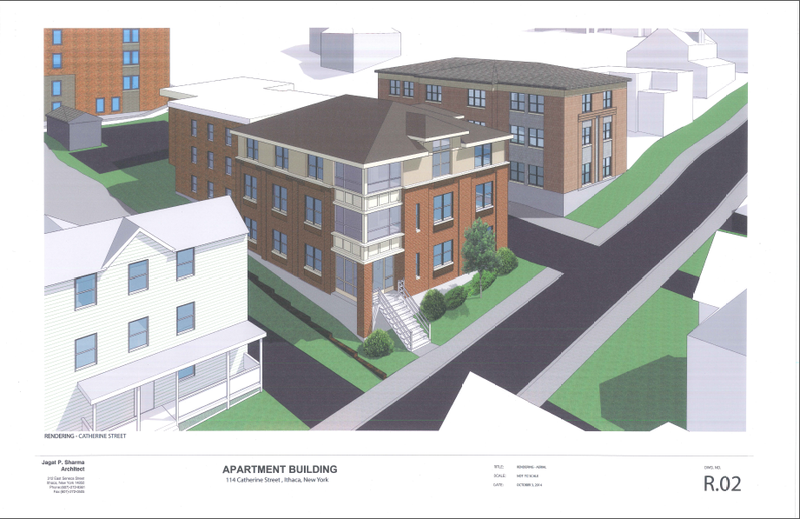 A sketch plan is due to head to the Ithaca Landmarks Preservation Council this month. It’s a small piece of real estate in a historic district, neither of those details beckons development opportunities. The property was offered for sale at $175k, which is $75k above assessed value, and is zoned to allow up to 4 housing units. 2. Some additional documentation about 114 Catherine. Cover letter here, Site plan Review drawings here, and Site Plan Review forms and documentation here. Apparently they were reusing the Dryden South SPR and forgot to update the numbers; Sharma has so many projects going they can’t keep in track. About the only difference from the old renders to these new ones is the addition of narrow windows into the brick face of the front facade, and some cute cut-and-paste vegetation. According to the docs, the new 3-unit, 17-bedroom building will cost about $500,000 to build, and has a timeline of January 2015 to July 2015 (for August move-in, presumably). This is a key detail – developer Nick Lambrou wants his project done before projects like Collegetown Crossing, 327 Eddy and others start major work; bigger demand for construction workers will drive the labor costs up, so he’s trying to get his project completed before that happens. Look at it as an appetizer before the main course arrives. 3. 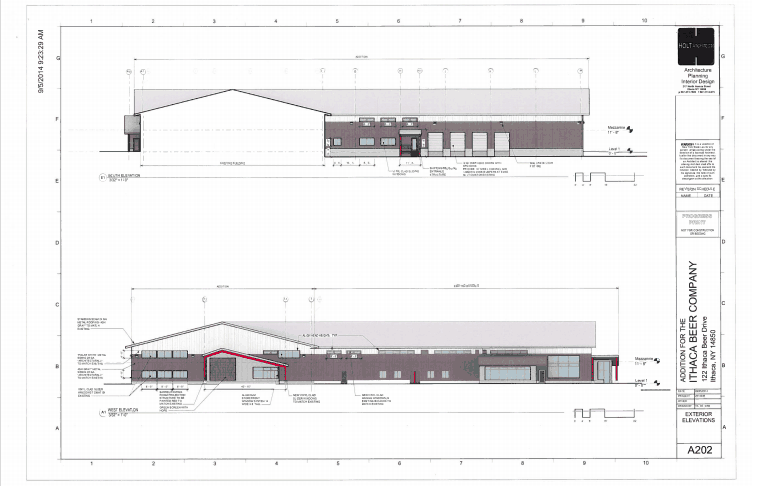 Next up, a few more details on Ithaca Beer Company, courtesy of its TCIDA application. Apparently, the construction on this project is supposed to start very soon – mid-November, for a May 2015 completion. A PDZ is very encompassing, and as close to carte blanche as town zoning gets. There’s not much the town needs to sign off on. And although winter construction is difficult, the foundation can be poured during the winter, given proper precautions. The cost of construction and new equipment will be approximately $7.2 million. The total cost of tax abatement requests (property, sales and mortgage) is about $350,000, most of that being in property tax. The addition is expected to create 22 new jobs (IBC currently employs 42), of which 18 look to be living wage. IBC has received tax incentives in the past and met or exceeded its obligations; I don’t see this application causing much fuss. I think this is the Ben Weitsman of 132 Cherry Street? A branch of the Upstate Shredding metal scrapping company? I’m not sure if the plans are industrial or something else, there have been rumors of residential projects being considered in this area. It’s something to keep an eye on in the coming months. 5. 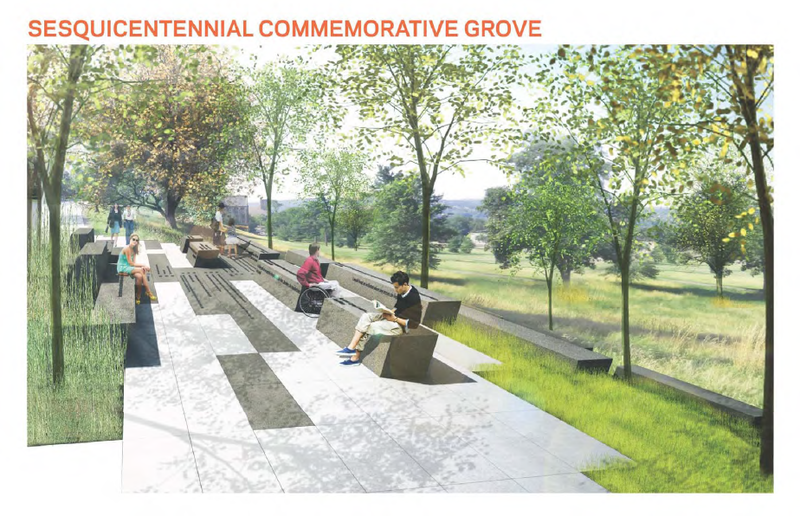 From the Cornell Daily Sun, looks like Cornell “Sesquicentennial Commemorative Grove” is complete. That was surprisingly quick. The formal dedication will be the Friday before Cornell’s Homecoming.